There is no shortage of advice for users to improve the performance of Photoshop. RAM is always king, the more you have, the better off you are. But having it isn’t enough, you have to know how to manage it. Here are a few things that have helped me improve performance in Photoshop CS5 (though they’ll most likely work just fine in versions CS3 and CS4 as well). Before digging around in the Photoshop preferences, quit any other apps that you are not using. This frees up additional system resources to devote to Photoshop instead. Go into Photoshop’s preferences (Command + K) and select the Performance item from the source list on the left. The first thing to adjust is the Memory Usage. I generally keep the RAM set between 60-70% with the slider. This allows me to use a good amount of my RAM for Photoshop, but still leave enough for other apps and the System itself. However, if you have less than 4GB of RAM, you should probably stick to 50% max. Your mileage may vary. The next thing to adjust is your History & Cache settings. You can use the preset buttons (hover over them for a brief description of which you should use). Only my laptop, I use the settings you see in the screenshot above. Because I tend to use my laptop for web or other low-resolution work, the settings have worked superbly. This is really only relevant to those users with multiple hard drives, so those of us on laptops generally can ignore this one. If you’re running Photoshop CS5 Extended, you can also check the 3D preferences and up the VRAM (video RAM) use to the max amount. I don’t do any 3D work, so I can’t tell you how well this works or not, but I keep it set to the max anyway. Caching image previews has a tendency to slows things down within Photoshop. From the Photoshop Preferences menu, click on “File Handling” and set “Image Previews” to ‘Never Save’. This reduces Photoshop’s RAM and CPU usage by avoiding the image previews. If you work with a lot of layers in your Photoshop document, you can reduce the size of the individual icon layer thumbnails. The smaller the icon, the less memory Photoshop needs to redraw those thumbnails every time you make a change to a layer. 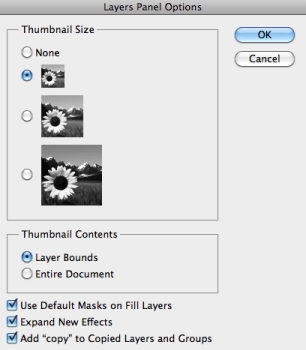 Just make a quick trip to the Layers panel flyout menu and choose the Panel Options… menu item. You can also turn those layer thumbnails off completely if you’re really organized with layer naming. There are numerous other tips that can help speed up Photoshop. Limiting the number of fonts installed and active is huge. You can also limit the number of files Photoshop remembers in the File menu list (adjust in the Photoshop preferences). Keep the layer count down as much as possible goes a long way, and not using Photoshop’s built-in Navigation panel with its giant thumbnail is a great idea as well. While these tips are specific to speeding up Photoshop, the tweaks may apply to other Adobe apps that have similar preference options too. Hi, thanks for the useful article. I’d also like to add that by changing the process priority on Windows by ctrl alt delte -> process (tab) -> Right click on the photoshop process change priory. Ensure you have saved all open files in photoshop first to prevent any loss of data.